“We will respond to the threat of climate change, knowing that the failure to do so would betray our children and future generations,” President Obama announced back in January at his second-term inauguration. Thus began another year of steady climate change, continued pollution of the atmosphere and half-hearted attempts at changing the world’s dire trajectory. 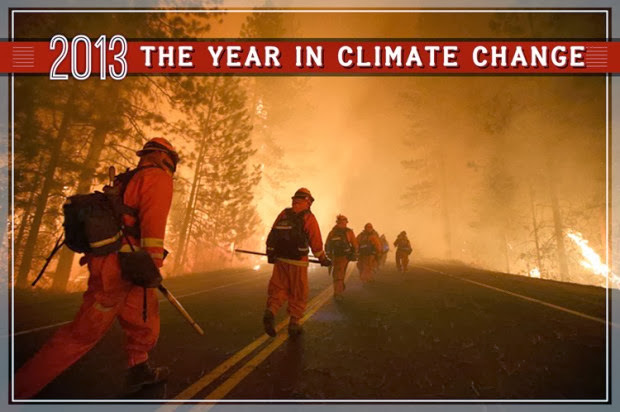 7: Where 2013 ranks among the warmest years in history, according to the World Meteorological Association. Tied with 2003, the ranking is based on the year’s first nine months, during which average temperatures were 0.86°F above the 1960-1991 global average. 395.5: The average concentration levels of CO2, in parts per million (ppm), observed in the atmosphere through November. 400: The ”milestone,” in parts per million of atmospheric CO2, that was temporarily crossed in May. It was the first time carbon levels crossed that boundary in 55 years of record-keeping — and possibly in 3 million years of history on Earth. 95: Percent certainty with which IPCC scientists say climate change is caused by human activity, a confidence level up from 90 percent in 1997. 1,100: Amount by which EPA regulations proposed in September would limit emissions from new coal-fired power plants, in pounds of CO2 per hour. The average plant currently emits CO2 at a rate of 1,800 pounds per hour. 1,000: Air pollution levels in the Chinese city of Harbin, in micrograms per cubic meter of PM 2.5, during October’s smog emergency. According to the World Health Organization, it shouldn’t exceed 20; anything higher than 300 is considered hazardous. 8: Age of girl in Harbin who contracted lung cancer. 3.8: Percent by which Japan said it would try to reduce its emissions by 2020, down from its previous pledge of 25 percent. 1.97 million: The annual minimum extent of Arctic sea ice, in square miles. Melting this year wasn’t as severe as it was in 2012, but the remaining area was still 17 percent below average — and the sixth lowest on record. 3.2: Current average sea level rise, in millimeters per year. Sea levels reached a record high in March. 104.6: The average country-wide temperature, in degrees Fahrenheit, on January 7 in Australia — the continent’s hottest day on record, in its hottest month on record. 121.3: The temperature reading, in degrees Fahrenheit, in the South Australian town of Moomba on January 12. 129.2: The temperature, in degrees Fahrenheit, recorded in California’s Death Valley on June 30, setting a record for the hottest temperature ever recorded on Earth for that month. 2: The weather emergency level declared by officials in China during this summer’s heat wave — a number normally reserved for typhoons and floods. 1.7 billion: The estimated cost, in USD, of New Zealand’s drought — its worst in 30 years. 10: The number of consecutive months during which over half of the contiguous U.S. experienced moderate or severe drought, which finally fell below 50 percent in mid-April 2013. 72: Percent of land area in 10 Western states in drought conditions after a record-breaking heat wave in June. 3.95: Inches of rain that fell from January to November in San Francisco. When the final numbers come in, it’s likely that California will be found to have had its driest year on record. 257,000: Acres of land burned by the California Rim Fire, the biggest wildfire in Sierra’s recorded history, which caused over $50 million in damage. It was caused by a number of factors, drought and abnormal seasons included. 5.9 – 7.9: The amount of rain, in inches, that normally falls over two and a half months and instead pummeled central Europe between May 30 and June 1. Floodwaters in Germany rose to their highest levels in over 500 years. 1.3: The width, in miles, of the tornado that struck Moore, Oklahoma on May 20. Sen. Sheldon Whitehouse, D-R.I., caused controversy when he invoked the storm during a speech criticizing climate deniers. While researchers cannot be sure there was a link between climate change and the twister, they believe that a warming planet may host more frequent, stronger storms. 2.6: The width, in miles, of the tornado that struck El Reno, Oklahoma ten days later. It was the widest ever measured on Earth. 20 billion: Cost, in dollars, of plans laid out by NYC Mayor Bloomberg in June to make infrastructure improvements, including floodwalls and storm barriers, in preparation for the effects of climate change. 6,100: The most recent death count from Typhoon Haiyan, which officially became the deadliest storm in Philippines’ history. Bodies continue to be recovered. 90: The number of global companies that together account for two-thirds of greenhouse gas emissions, according to a report in the journal Climactic Change. 7 billion: The number of “key individuals” responsible for climate change. The Onion, as always, is spot on. The Fukushima NPP continues to disturb the general public even almost three years after the accident. New leaks of radioactive water beyond the protective dam took place recently due to heavy rain. People give less and less credence to nuclear experts’ assurances that the sea was not polluted. Meanwhile, the US newspaper The Cape Cod Times reports that toxic leakage from the NPP is approaching the US west coast. Seventy sailors from the USS Ronald Reagan that took part in the rescue operation after the accident are going to sue Tepco, the Fukushima NPP operator. The sailors claim that the company did not warn them about all risks that the crew could face. The aircraft carrier spent a month in the offing at the distance of ten miles from the NPP in a spot of radioactive fallout. The crew desalinated overboard water and drank it and used it for cooking, which caused cases of cancer and even blindness. Oceanic pollution within 10 miles around the NPP is understandable. The main part of nuclear disintegration products got into the water and not into the air like in Chernobyl. Ocean currents carry harmful substances far away. Even in other parts of the world fish and seafood drawn from contaminated streams can be dangerous for humans, Maxim Shingarkin, Deputy Chairman of the State Duma Committee for Natural Resources says. 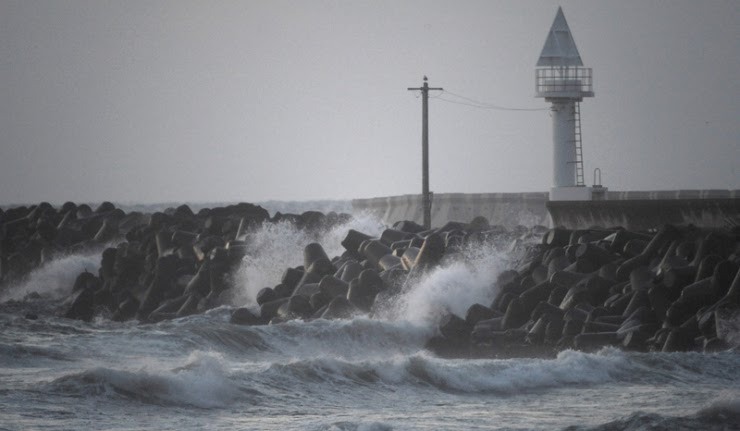 "Currents in the World Ocean are so structured that the areas of seafood capture near the US north-west coast are more likely to contain radioactive nuclides than even the Sea of Okhotsk which is much closer to Japan. These products are the main danger for mankind because they can find their way to people’s tables on a massive scale." Contaminated fish can swim anywhere, so fishing is not absolutely safe in any region of the world any more. It is impossible to test the entire catch for pollution, just as it is impossible to introduce a universal ban on fishing. The Japanese government has just partially banned fishing in the most dangerous areas. Vladimir Slivyak, Co-chairman of the Ecodefence international ecology group is speaking. "The Russian governmentplanned to restrict fishing in the Far East. As far as I know, no such restrictions have been introduced so far. Still it is possible that some steps will be taken." As for atmospheric pollution, radio nuclides from Fukushima reached California and Mexico 8 days after the accident. Russia was not affected, Maxim Shingarkin says. "Air emissions were not projected either on the Sea of Okhotsk, or Sakhalin, or the Far East, or the Kuril Islands. So airlifting cargoes does not seem dangerous so far. I mean so far because not all the nuclear fuel has been taken out of the power generation units. This means that radioactive emissions into the atmosphere are possible as a result of heating." It took years after Chernobyl to make detailed conclusions about the scale of nuclear pollution. We are having a similar situation with Fukushima, Vladimir Slivyak believes. "We’ll probably know the consequences of this accident in 10-15 years. It is clear that a large amount of fish, sea weeds and everything the ocean contains has been polluted. It is clear that pollution spreads all over Earth. It is clear that vast territories have been polluted in Japan itself. All this is generally clear. But we need research to provide more details and this will take a long time." Meanwhile, even now every blue-finned tuna fish drawn near the Californian coast has signs of radioactive pollution. This information is provided by one of the research portals (globalresearchreport.com). Most likely, polluted water approached those parts because the level of radioactive iodine in brown algae has risen over 200-fold. The level of caesium-137 has risen all along the US west coast. Caesium-137 has been found in local berries and mushrooms. Local residents often report the deaths of birds. Radioactive nuclides have even reached the shores of Alaska where the population of the sock-eye salmon has dropped dramatically. Some experts believe that we can expect more consequences of the accident at the Japanese NPP. Nearly three years after an earthquake and tsunami caused the greatest nuclear disaster in decades, Japan is still in the early days of its massive Fukushima cleanup effort. Powering the cleanup of the fallout zone is an army of workers making $60 a day to decontaminate the region. Now, where do you find people willing to work in a fallout zone for minimum wage? According to a Reuters report, hidden within hundreds of contractors working on the cleanup effort are yakuza-controlled companies that pay headhunters to find homeless people willing to work inside the fallout zone. The sheer scale of the cleanup effort is staggering. While decontaminating the Fukushima plant itself will cost tens of billions and take years, there are also the surrounding areas in Fukushima prefecture, where cleanup costs are expected to top $30 billion. With Tokyo Electric Power Co. (Tepco), the owner of the Fukushima plant, essentially nationalized at this point, Reuters reports that there's some $35 billion in taxpayer funds on the table for contractors. Members of Japanese organized crime were arrested three times this year "on charges of infiltrating construction giant Obayashi Corp's network of decontamination subcontractors and illegally sending workers to the government-funded project," which in some cases were homeless people hired by recruiters paid bounties on each minimum-wage worker they could sign up. Obayashi, Japan's second-largest construction company, isn't accused of wrongdoing; the subcontractors implicated in arrests were as many as three companies removed from Obayashi itself. How does that happen? There are hundreds of companies involved in the cleanup effort, and oversight is lacking. The total number of companies received taxpayer funds hasn't been released. "But in the 10 most contaminated towns and a highway that runs north past the gates of the wrecked plant in Fukushima," reads the report, "Reuters found 733 companies were performing work for the Ministry of Environment, according to partial contract terms released by the ministry in August under Japan's information disclosure law. Reuters found 56 subcontractors that shouldn't be allowed to be given government contracts because they didn't have proper clearances from Japan's construction clearances. Five firms listed on the Japanese Environment Ministry's list of cleanup contractors don't even exist. With a project that's unprecedented in scope, and one that's been rushed from the start, it's to be expected that there will be some level of waste. After all, finding experienced contractors to bid against each other is a lot easier for a road construction project than it is for nuclear disaster cleanup. But the morass of sketchy contracting companies and sheer lack of oversight as described by Reuters is astounding. But that lack of oversight isn't particularly surprising. A previous Reuters report found much of the same: With flat wage growth and few workers willing to take on the cleanup, hundreds of subcontractors have filled positions by relying on recruiters willing to find labor from anywhere. The oversight problem isn't limited to labor, either: Earlier this year, the Japanese Nuclear Regulation Authority (NRA) downgraded the Fukushima disaster to its worst rating since its initial post-earthquake peak, thanks to the finding that temporary tanks for storing radioactive waste were leaking at the power plant site. At the time, the NRA said it wasn't sure if Japan could manage the cleanup on its own. "The current situation is at the point where more surveillance won't be enough to keep the accidents from happening," NRA chairman Shunichi Tanaka told reporters at the time. "Our job is now to lower the risk of these accidents from becoming fatal." Along with the leaks from storage tanks, a number of massive leaks have come from the Fukushima site, largely ending up in the Pacific. At the center of those problems is Tepco, which remains the authority controlling the decontamination of the Fukushima reactors, and which has consistently failed to maintain proper records and standards, even following billion-dollar injections of government cash. In October, Japanese Prime Minister Shinzo Abe said his country was open to receiving international assistance, which came after a series of international calls for exactly that. It's unclear what form that might take, but having a stronger authority overseeing the project may help. Whether it's the power plant or the surrounding prefecture, it's becoming increasingly clear that the Japanese government has shown a severe lack of oversight of the Fukushima cleanup. Cenk Uygur, co-host: I was on MSNBC at the time when this happened, I said, “Don’t trust what the Japanese government is saying, they’ll say trust what the electric power company is saying. Go, go, go, get outta there. Get as far away from that plant as you can. It’s literally a core meltdown.” And they always don’t want people to panic, so they were always like, “Oh it’s going to be okay.” [...] I’m like, “You’re crazy man, don’t be anywhere near that reactor.” And I remember at the time, of course not at The Young Turks, but on cable news, people were like, “Hey Cheynk, you know, I don’t know that you want to say that, because the official government position is that it’s safe.” Oh, is that the official government position? Now go explain that to the people who served on the USS Ronald Reagan. Uygur: So the next time you hear the government tell you, “Oh no, no, this is our official position that it’s not that bad to be near the nuclear meltdown,” don’t believe the hype. Get the hell out of there. Unit 3 Mox Fuel is two million times more dangerous than any other reactor on earth , is spewing new Death Plumes , meaning new death streams . We will get them here in BC Canada tonight and yesterday and tomorrow etc etc . Think of the Death Streams like a big ground swell after a storm at sea that continues for thousands of miles till it slams into a few 1000 miles of coast line . The jet streams are distributing a percentage of those buckyballs all along the way and they hang there and get picked up by lower wind currents and carried along and picked back up in rain and snow or again by the jet stream like a continues flow we can not see , hear , smell , feel or taste . So how will you know how much , well its been a state secret for over a 1000 days , do you think its because nothing happened or do you think its because something is happening constantly and a hand full of people decided no one can tell you . The Cass County Sheriff's Office is strongly recommending an evacuation of the entire City of Casselton and anyone residing five miles to the south and east of Casselton, effective immediately. Information from the National Weather Service indicates a shift in the weather resulting in a high pressure system that will push the plume of smoke down increasing the risk of potential health hazards. Those in the areas south and east of Casselton are also encouraged to consider evacuating, specifically Durbin Township and Everest Township east of ND State Highway 18. Those evacuated should go to a safe location until further notice. If evacuees need a place to go, the Red Cross and Salvation Army have organized a shelter at Discovery Middle School, 1717 40th Ave S, in Fargo. If children are located by emergency responders they will be brought to Central Cass High School for reunification with a guardian. If transportation is needed from your home, contact the Cass County Tactical Operations Center at (701) 297-6000. This evacuation is precautionary and in anticipation of potential changes in wind direction. Those within the evacuation zone are not currently in immediate danger but the potential exists if the wind changes direction. Cass County Sheriff's Deputies and Casselton Fire Fighters will be going door to door in the evacuation zone to inform and assist those who reside in that area. The shelter at Discovery Middle School will be opened by 6:30 p.m. Monday night. Anyone coming to the shelter should enter through west gymnasium doors. The Red Cross is preparing to take in 100 people at the shelter, but have the capacity to hold up to 500. The shelter will be equipped with cots, food, and other necessary items for families displaced. A Red Cross disaster mental health professional is also being deployed to the shelter to provide emotional support. From the Cass County Sheriff's Office: A 104 car BNSF Train collided with another train while traveling eastbound approximately one mile west of Casselton, ND. How the collision occurred is unknown at this time. The east bound train was carrying crude oil. Approximately 10 cars are fully engulfed resulting in heavy smoke in the area. Casselton Fire and the Fargo HazMat Team are currently battling the fire. This is a HazMat incident. All people and animals within a 10 mile radius of Casselton, ND should find shelter and avoid going outside until the incident and area are deemed safe. BREAKING NEWS: A train is derailed west of Casselton, North Dakota. It happened at 35th Street and 154th Avenue Southeast just before 2:20 p.m. Monday. No injuries have been reported so far. Several area emergency teams are on scene and are setting up an incident command center. The Cass County Sheriff's Office says a train went off the tracks and a second train hit it. Several train cars are on fire and huge plumes of toxic, black smoke can be seen for miles. Several explosions have also been reported. Emergency crews are urging people to stay inside and a code red alert has been sent out to residents in a two mile radius of the accident. The Casselton Fire Department says a Burlington Northern Santa Fe train is involved. An unknown number of cars derailed, but we're told the train that is derailed was pulling more than 100 cars, some carrying oil. The wind is from the northwest, which means the smoke may miss Casselton but people living to the southeast of town are being told to stay inside. 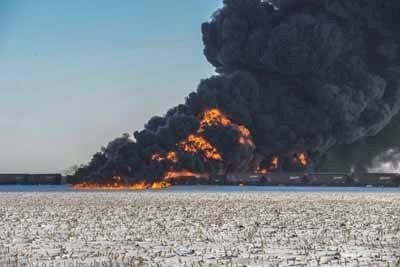 The Casselton Fire Department says there is some concern that the derailment is near an ethanol plant. A Valley News Live Crew is on scene. We will bring you more pictures and more information as soon as we get it. 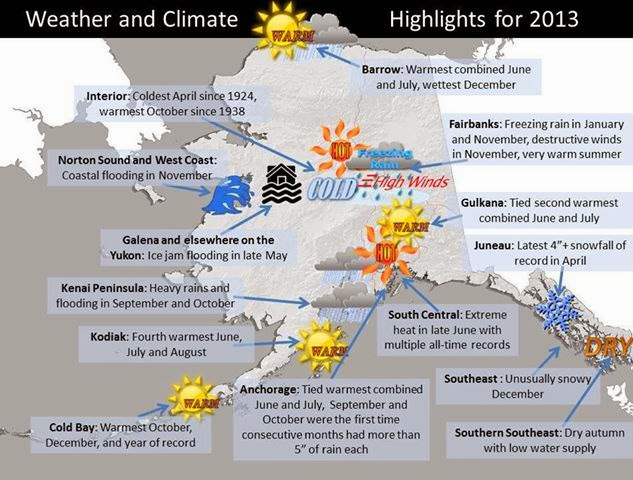 2013 was a remarkable weather and climate year for Alaska, with extremes of heat and cold, severe ice jam and coastal flooding and even drought. January brought the coldest weather of the year, with a climate station near Delta Junction recording the lowest official temperature of 63° below on January 28th.The spring was very cold over the mainland but this was followed by extremely warm weather during the summer. Juneau saw the latest 4+ inch snowfall in its long weather history on April 26th, and for the first time in more than 40 years the winter snowpack in Anchorage held on into May. The cold spring was directly responsible for the devastating ice jam flooding that struck Galena in late May. The high of 97°F on June 17th at Amber Lake, southwest of Talkeetna was just three degrees shy of the all-time record for Alaska, and Fairbanks had 36 days with highs of 80°F or higher, by far the most ever in one summer. The summer was especially dry in the southeast Interior, resulting in a poor hay crop. October was extremely mild across the state, in some places the warmest of record, and in southern Southeast was also unusually dry. November brought damaging coastal flooding to some western coastal communities and significant freezing rain to many areas. At Fairbanks this occurred with damaging winds that toppled snow and ice laden trees and knocked out electricity to a third of area customers. 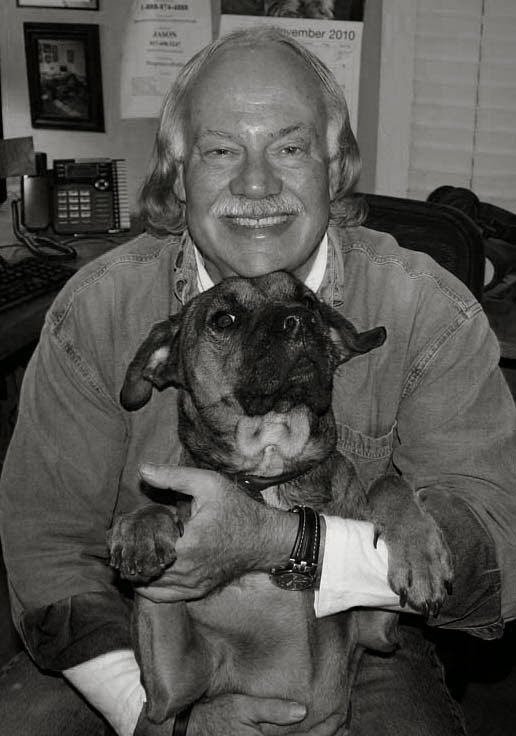 Mike Ruppert is stepping back from Facebook and the need to go through everything that is posted on his page. It makes no sense in the world for his talents to be bogged down in this way. It will free him to make an even more contribution than he is already. There are three things which unequivocally and absolutely guarantee the Near Term Extinction of the human species and quite possibly all life on the planet. They are out on the table, acknowledged, repeatedly confirmed and corroborated and they are having direct, painful and tangible impacts on our lives this minute. And they all have direct bearing on each other. The first of these is Global Warming and Climate Chaos caused by human industrial activity (infinite growth). Of a certainty a four to six degree Centigrade temperature increase is in the very-near future, and -- by what is now not an extreme calculation – the last of our species should be gone by 2030 because the ecosystem which we need to provide us food, water, air and habitable climates will have been destroyed, the web of life ripped to shreds. It may very well happen much sooner than that. According to Guy McPherson, the only thing which might have the slightest mitigating impact on Global Warming – over which humankind has any control – would be the immediate cessation of all industrial activity on a planetary level, immediately removing the ever-increasing release of carbon into the atmosphere, by a meme which runs us and owns us, rather than the other way around. It is a meme which must play itself out. The second of these “causes of death” is radiation. By now we understand fully that the totally unresolved and uncontrolled disaster at Fukushima has for 33 months bombarded the entire Northern Hemisphere and Pacific Ocean with radiation. A lesser realized truth is that there are some 60 nuclear power plants around the United States that are boiling along long past their planned operating lives. They are rickety. They have fires. They have leaks. They have cooling system failures. They flood. There are also many nuclear storage facilities like Hanford and West Lake outside of St. Louis which in the case of Hanford are releasing or Westlake (in danger of releasing) additional enormous quantities of radiation into the air, the water tables, or the soil. It takes 40 years, a lot of money (energy) and an enormous amount of fossil fuel to fully decommission a nuclear reactor. Absent industrial civilization it will never be possible to safely shut down all 450 operating nuclear reactors and recover or maintain control of perhaps thousands of nuclear waste facilities around the world. And our obligation is to provide safe and secure storage for all of that radioactive waste for one million years. Mankind has yet to build a structure which will last 50,000 years, let alone a million. But there is a third element that triply seals our fate. It is called Exponential Growth… Just recently on Facebook a friend posted a great video from the late Professor Al Bartlett of Princeton who, throughout his career, was the Champion of sounding the alarm on what Exponential Growth means. He was a fabulous human being with a wicked sense of humor. It isn’t higher math. It’s actually simple arithmetic. If one starts with a square on a checkerboard and puts one grain of rice on that square, two on the next, four on the next, eight on the next, doubling for each square, by the time one reaches the last of 64 squares there will be an amount of rice greater than the annual output of most Asian nations combined. Now let’s look at infinite growth as though it were taking place in a glass, or a Petri dish, or on a finite planet which -- when full and containing no more resources – spells the complete die off of whatever was growing inside due to resource exhaustion. It’s true for Caribou. It’s true for bacteria. It’s true for human beings. As the late Terrence McKenna warned as he predicted “the end of history” in the late 1990s, if the doubling takes place every minute, then just one minute before the inevitable population collapse, the Petri dish would only be half full. When McKenna sounded these warnings, roughly a decade before I started, human population was only 3.5 billion. Human population has since doubled in less than 20 years. With enough resources it would double again in less than 15. But we can clearly see that the Petri dish is full. 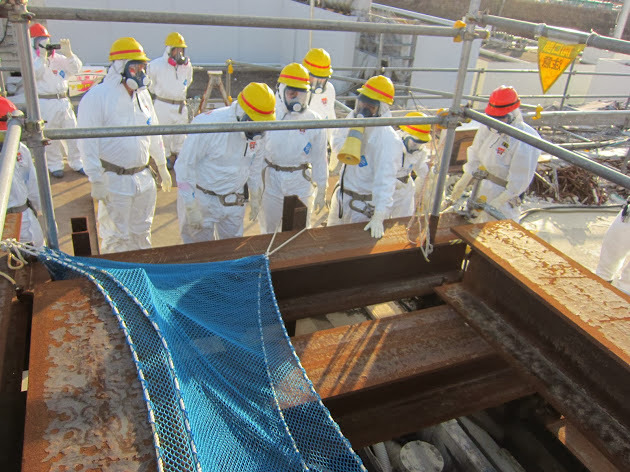 Fukushima’s ongoing deadly release of radiation has not been contained for 33 months. New records for radioactive emissions are announced weekly. The Japanese – as they have done continually for more than 30 months -- are incinerating tons of highly radioactive waste directly into the atmosphere. The International Atomic Energy Agency has granted TEPCO permission to release ALL of its radioactive water into the Pacific. The carnage that is human industrial civilization continues absolutely unabated and unrestrained. Tens of thousands of coal fired generating plants continue to operate around the world. 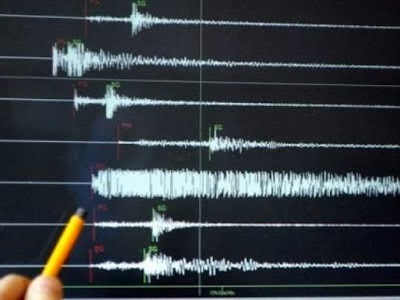 Tens of thousands of natural gas fired plants using fracked gas continue to destroy water tables, cause earthquakes and add to the ever-increasing amounts of carbon released into the atmosphere. The plants themselves may not, but the extraction of the gas they burn is one of the most carbon intensive and destructive, toxic processes known. In Canada the tar sands are being voraciously mined with continuing release of carbon, environmental destruction, and rapacious ruination of fresh water supplies. In North Dakota, so-called “shale oil” production proceeds with ferocious intensity. Factories and corporations required to show “growth” and profit continue to churn out cars and TVs and cell phones and junk, all wrapped in plastic which will last about as long as radioactive waste. And because the cheap, easy energy is gone, every year industrial nations resort to more damaging, more desperate, more carbon-intensive means to get their hands on less and less energy, often expending more energy to obtain what they all fuel than they get from burning it. Absolutely nothing has been – or is being – done about the things that are really killing us, and not just us, but every living thing on the planet. Just a lot of talk. Well I’ve been talking for 35 years and I’m almost done with it. Every day, as more than 250,000 new humans arrive on the planet, more than 200 species go extinct… forever. Exponential growth of human population has never been addressed, in large part because the economic mandate for infinite growth has never been addressed. Thus the pressures to not do anything at all about the first two problems are ever greater. I call it “Catch 22 Cubed.” More people need more heat, more power, more food grown with fossil fuels… More, more, more. This is the end of More. As the Eschaton event emerges, and as we approach it with ever-increasing clarity about what “it” is I have noticed on Facebook -- where I have invested enormous energy in community building and consciousness raising -- a disappointing trend of late. Briefly summarized, it goes like this: The more clearly we see our imminent physical demise, the more people tend to talk about things that are irrelevant to it. They want to talk about Ed Snowden. They want to talk about disaster capitalism. They want to talk about Iran-Contra. They want to talk about whether a specific and alarming radiation reading, in Death Valley, or Idaho, or Colorado, or Washington actually came from Fukushima or not. They want to talk about who did or did not make a good reading somewhere. They want to talk which competing theory/hypothesis on the actual conditions at Fukushima is correct instead of abut the fact that we know what we are being told is an absolute lie. They want to talk about Albert Bartlett’s personality as opposed to the simple arithmetic he presented which they still refuse to see. I have reached a point of diminishing marginal returns on Facebook and this week I pretty much exiled myself from the page. I do not need to read all these stories that get posted. I find about 90% of them irrelevant now. And I’m real confident that I’m doing some of the best work of my entire life right here on the Progressive Radio Network with you every Sunday. My Facebook page is an amazingly useful, safe, well-crafted and productive space, free from disinformation. In my absence it will be cared for and protected by loyal friends and tribal members who have been there for the whole ride. I will check in from time to time and make announcements about upcoming shows or when something really serious happens. We know what’s here. We are beginning to understand what it means. And it’s high time we turned our full gaze and attention to it. This is the culminating event of all of what we have called history. In upcoming shows I’ll be discussing more of the only thing that makes sense of it all – and is doing more so every week -- and of my own life’s long and arduous journey. I call it “The Safety Valve at the End of History”. Alaska Air cancellations due to radiation? ?